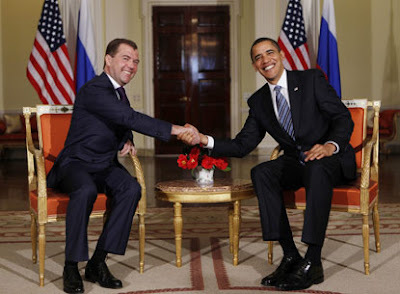 WASHINGTON – The lame-duck Senate voted 71-26 today to ratify President Obama's strategic arms reduction treaty with the Russians, which numerous Reagan and Bush administration defense experts say will put America at a strategic disadvantage. The Obama administration is "intent on putting the United States out of the nuclear weapons business," said Frank Gaffney, president of the Center for Security Policy and a former acting assistant secretary of defense for security policy. Gaffney accused Obama of following a policy of "radical denuclearization." "Ours is the only country they can denuclearize," Gaffney lamented. The so-called New START treaty limits each side to 1,550 strategic nuclear weapons but fails to address the massive 10-1 Russian advantage in tactical nuclear weapons. Disputes over interpretation of the treaty may allow the Russians to expand their nuclear advantage even further. "The Russians have already said they think they can have 2,200 warheads, far more than the 1,550 they're supposed to have," said Gaffney. Critics say the treaty poses a serious threat to U.S. security by restricting America's ability to develop and deploy missile defenses against threats posed by a number of potential foes. It also, they say, cripples American ability to verify Russian compliance with strategic arms deals. In addition, the treaty gives the Russians the capability to quickly expand their number of deployed nuclear weapons should they decide to withdraw from the treaty, according to defense expert John Kwapisz. "This is a bad day for the future safety of the American people," said Kwapisz, with Gaffney an organizer of the New Deterrent Working Group, a coalition of more than 30 former defense and foreign policy officials and strategic weapons experts who sent the Senate a Dec. 20 open letter opposing the treaty. Kwapisz is former executive director of the Center for Peace and Freedom. "These were the real nuts and bolts people involved in the hands-on implementation and design of security policies," said Kwapisz of the working group, contending they are better judges of the treaty than the prominent politicians and diplomats advanced by the Obama administration to support it. What makes you think that this Marxist POS didn't have this end in mind? He's purposefully sabotaging our defense as well as destroying everything else he touches!